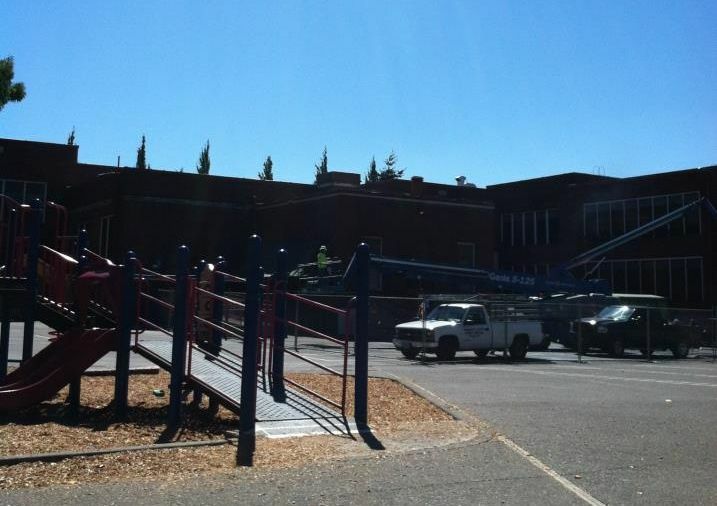 If you’ve been by SES this week, you may have seen the big chimney coming down. This is great news for seismic safety at SES, and many other schools in the PPS district. In February of this year, the Portland school board<http://www.oregonlive.com/portland/index.ssf/2012/02/unable_to_pass_a_bond_portland.html> approved a loan to convert oil burning boilers to natural gas furnaces at 47 PPS sites, including Sunnyside. Because the gas furnaces aren’t as dirty, the chimney doesn’t need to be as tall, so the SES chimney has been lowered to 2′ with a 4′ steel pipe protruding. The chimney has been one of the bigger concerns for the Rock-n-Roll Committee (aka Safety and Resilience Committee) as we’ve reviewed the building for seismic safety. Now we have a lot fewer bricks to worry about!